In Mad About the Man we meet Brie Grayson an up and coming lawyer and Maddox Monroe a self made millionaire hotel mogul. However, when we meet these two on a tennis court where Brie's law firm is trying to land taking over Maddox's affairs it's not the first time they've met they just had no idea until they came face to face. See they went to school together when they were 12 and what does a 12 year old boy do to the girl he likes, he tortures her. He made 7th grade a living hell for Brie, so much so she has spent her entire life hating him. She even told her sisters about the boy who picked on her relentlessly in school. Then she moved on to private school and he was in the rear view mirror until now. When they come face to face Maddox cannot help but resort to his old antics and egg Brie on. Brie is older, more secure and extremely competitive. While she knows she is there to win Maddox over and take over his affairs for her law firm she cannot take it. On comes a tennis match to end all tennis matches, they are playing pairs and her and Maddox play as if they are alone trying to out do each other. Eventually even after a warning from her colleague he pushes her too far and she beams him with the ball. She hit him so hard his face needs medical attention. On Monday when she gets to work she assumes this will be her last day, however, she is surely surprised to not only not being fired but being made partner along with her specifically taking over Maddox's account. See he has not given anyone the chance to take over he has stayed with the firm he has been with and never moved. Why now and why her??? That's the question. Maddox Monroe has always had a thing for Brie and it's time she was his for awhile. He doesn't do long term but he does enjoy spending time with one woman until he's done and they move on. His next conquest will be Brie. For her it's over her dead body even if her body disagrees when Maddox is there and kissing her. Eventually she gives in because this is just physical and she can do physical while it last with her. Slowly but surely her walls break down and slowly but surely Maddox realizes maybe he can be with someone forever. But when secrets are found can they get beyond them to make their happily ever after. 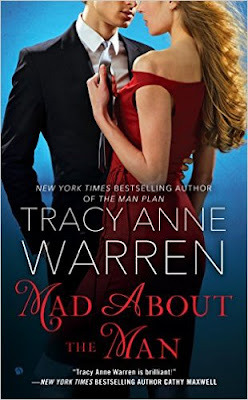 I really loved Mad About the Man, it would have been a 5 star for me but I think there was just a little too much time spend on the resolution, there is a fine line when conflict is good and over the top. It was just a little over the top for me. But still a great read with great characters. So for me a 4 star with my recommendation to read.